TAGUM CITY, Davao del Norte - Liaa Margarette Amoguis, Juliana Marien Villanueva and Maiki Samantha Gonzaga delivered the three golds for Davao City on Day 2 of the Batang Pinoy 2019 Mindanao Qualifying Leg swimming competition at the Davao del Norte Sports and Tourism Complex here yesterday. Davao City, which garnered six golds, three silvers and eight bronzes Wednesday, yesterday hauled three golds, seven silvers and six bronzes. The 11-year-old Amoguis, a student of Abbas Orchard Montessori School, struck another gold in girls 12-under 200m freestyle by checking in at two minutes and 23.64 seconds. She sprinted past Butuan City's Calythea Lumag (2:34.13) and General Santos City's Nova Rea Estrada (2:34.14) who winded up with the silver and bronze, respectively. She also took a silver in girls 15-under 400m individual medley (IM), losing to 14-year-old Villanueva. Both Dabawenyas went head to head in the first 300 meters but in the freestyle stage, Villanueva pulled away to clinch the gold with a time of 5:30.23. Amoguis clocked 5:34.63. Amoguis, who topped the girls 12-under 200m IM and 100m butterfly Wednesday, said, "Not good," when asked to comment on her second day swim. She will try to improve on her last two events today. Villanueva, who also ruled the 800m freestyle in the opening, however, copped a bronze in girls 13-15 200m freestyle. "I am happy with my performance today. I made all my swim. I'm not really after the gold but I want to beat my best time as much as possible," Villanueva said in an interview with SunStar Davao. She will next compete in 400m freestyle today. 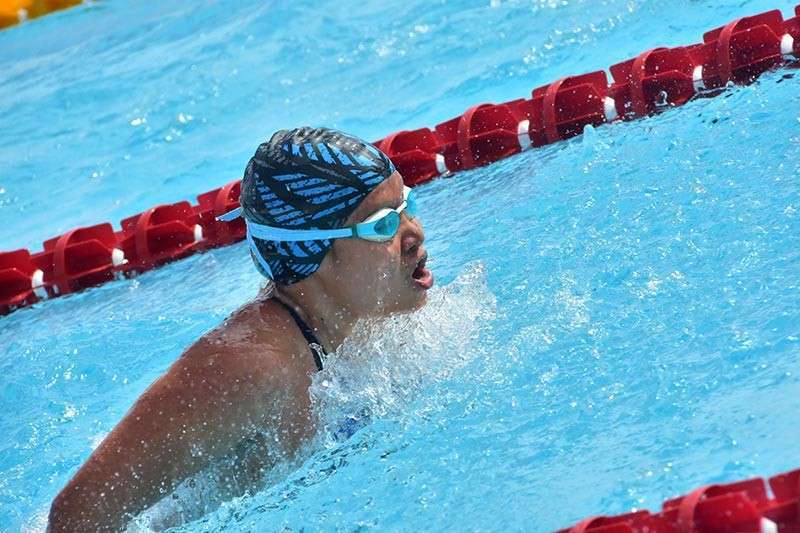 Gonzaga, for her part, marked her Batang Pinoy debut with a golden finish in girls 13-15 50m butterfly (28.51) as teammate Alissa Ysabella Lazarraga (31.31) ended with a silver. Gonzaga, a 14-year-old Grade 8 student of Ateneo de Davao University, said her feat was unexpected. "I just wanted to enjoy my swim," she said in a separate interview. Davao City axed silvers from the efforts of Matthieu Adrien Tao (boys 13-15 200m backstroke, 200m freestyle), Lora Micah Amoguis (girls 13-15 200m backstroke), Francis Greg Espiritu (boys 13-15 200m breastroke) and Rissa Angelian Sahagun (girls 13-15 200m breastroke). Bronzes went to Dabawenyos Khyrstian Tan (boys 13-15 50m butterfly), Ivo Nikolai Enot (boys 13-15 200m backstroke), Lazarraga (girls 13-15 200m backstroke), Maica Angela Garcia (girls 13-15 200m breastroke) and girls 15-under 200m medley relay team of Joanna Kayla Gonzales, Angela Marie Lao, Lazzaraga and Alexis Shama Balana. The swimfest is set to wrap up today.